The answer is - "Satyanarayan Puja". Satyanarayan Puja is a holy ritual of worshipping Lord Vishnu. Satya means truth and Narayan means the Supreme Being. Hence, Satyanarayan means: "The Supreme Being who is an embodiment of Truth". It is by Satyanarayan Puja, a person receives the blessings of Lord Vishnu who always nurtures His devotees and showers health, wealth and prosperity in their lives in abundance. Although Satyanarayan Puja can be performed on any day, but this Puja is considered specifically auspicious on a Full Moon day (Poornima). During the ritual of Satyanarayan Puja, a katha (story) is told which finds its mention in the holy Skanda Purana. The katha is called "Satyanarayan Katha" and it is an integral part of Satyanarayan Puja. A very significant part of Satyanarayan Puja is the invoking of the Pancha Lokapalakas (Vishnu, Shiva, Ganesha, Shakti and Surya), Navagrahas (Nine Planets) and the Eight Dikpalakas (Kubera, Yama, Indra, Varuna, Shiva, Agni, Vayu and Nirrti). So what are you waiting for? Satyanarayan Puja pleases Lord Vishnu and makes us receive His blessings & benevolence in our lives. Satyanarayan Puja brings prosperity in an individual's life. Satyanarayan Puja brings harmony in family relations. Satyanarayan Puja removes all financial problems from a person's life and bestows abundant wealth. Satyanarayan Puja is highly beneficial for people involved in a business as this Puja protects a business from regulatory hurdles and damaging competition in the market. Satyanarayan Puja brings a significant increase in business orders along with ample cash flows. Since Satyanarayan Puja blesses a person with gain in wealth, it also promotes growth in the career of people who are in the job sector as well. Satyanarayan Puja gives relief from ongoing ailments and blesses the native with good health. Satyanarayan Puja makes the Navgraha (Nine Planets) conducive to the native by enhancing the strength of benefic planets and bringing an end to the wrath of malefic planets in his/her life. Satyanarayan Puja brings gains in capital invested by a person. Satyanarayan Puja attracts gainful real estate ventures in a person's life. Satyanarayan Puja protects an individual from all harms and dispels fear of insecurity. Satyanarayan Puja brings a person out of legal troubles and favours a person in matters of administrative tussle. Satyanarayan Puja promotes chances of beneficial travels both domestically and abroad on account of both work & leisure. 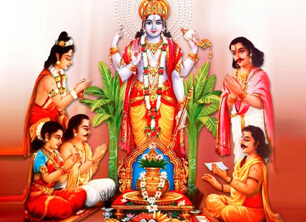 Satyanarayan Puja including Satyanarayan Katha on your behalf by highly learned Brahmin Priests to bring forth the divine blessings of Lord Vishnu in your life. Arrangement of watching the Puja from the comfort of your home via an online link. Note: The Satyanarayan Puja is performed in strict accordance with all Vedic rules & rituals as prescribed in the Holy Scriptures. Why should I go for Satyanarayan Puja? Lord Vishnu is the Supreme God that nurtures all beings and brings His devotees out of all troubles in this world. One must note that Lord Vishnu's blessings bring abundant wealth, never lasting prosperity, ultimate joy and family bliss & harmony in a person's life. Therefore, His blessings always ensure a wonderful life that is full of success & happiness. Who will perform the Satyanarayan Puja? Absolutely, you can watch the Satyanarayan Puja being performed in your name via a recording provided to you by us. Is there any minimum age to go for Satyanarayan Puja? No. Anyone can go for this Satyanarayan Puja. Can I book the Satyanarayan Puja for someone else in my family? Absolutely! What better gift can you give to your near and dear ones, than making sure that they get the blessings of Lord Vishnu that propels a person towards incredible prosperity!